Get ready to swing your skirt! 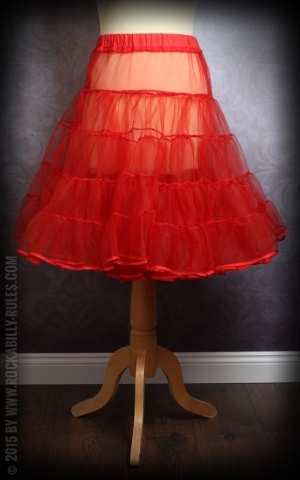 A petticoat dress is the right choice to revive the times when rock'n'roll blasted out of the jukebox. Here you find beautiful petticoats in different colors and lengths. Wear them with swing and rockabilly dresses or full skirts and you will turn heads around - not only on the dancefloor. Already in 16th century petticoats were popular with women. Among other things they should highlight the hips, give the impression of a small waist and provide a fashionable shape. 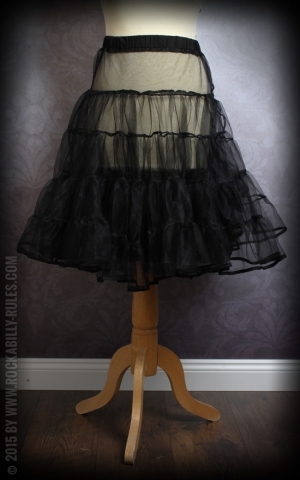 In the 20th century petticoats came back into fashion. Now they were increasingly made out of nylon and chiffon and especially popular with young teenage girls who liked to wear a petticoat dress on the dancefloor. Swinging petticoats became snynoymous with the rock'n'roll era of the 1950s, youthful vitality, romance and rebellion - a mixture which hasn't lost its charme until today. 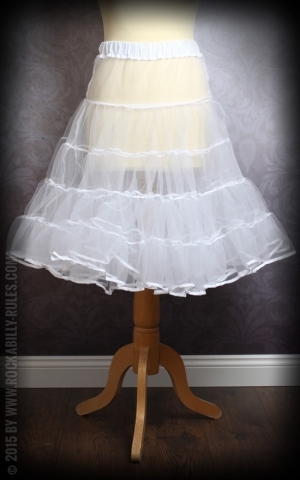 A petticoat dress is a true eyecatcher on every dancefloor. Pair it with a polkadot or swing dress and you will let your competitors look pale. The authentic style and the high quality of these petticoats guarantee that you also make a lasting impression if you don't feel like moving your legs. Add nylons and high heels for an explosive mixture.